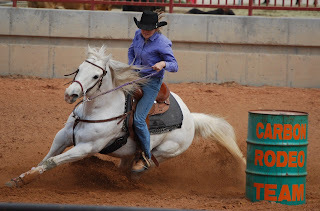 Think about speed events at a rodeo. They are usually done in 15 to 30 seconds. Anytime spent doing anything but running hard makes your time slower. So, when running speed events forget about your hat. I have seen a lot of kids lose because they were concerned about their hat. If you are concerned about your had comming off wear a string to keep the hat on, however I do not recommend this. The hat can slide if you are turning a quick barrel and get stuck in front of your face. (True story! Ask me about it sometime.) The best thing to do is get a hat that fits properly and if it comes off, it comes off. It is better to get a squished hat than to lose because you tried to catch or adjust your hat. great tip. I agree totally and if it is a hat you don't want to get squished probably shouldn't wear it to the rodeo.